Football is a monster. There’s no denying its popularity, heck, it owns a day of the week. Millions and millions watch every week, but it’s also the most violent. While the movie Concussion brought to light the severity of head injuries in the game to the masses, I’ve been fortunate to speak with some of the smartest, most knowledgeable people that specialize in this sort of trauma over the past three to four years. In 2014, I spoke with Chris Nowinski, former WWE wrestler. He was forced to retire in 2003 after a series of concussions left him with post-concussion syndrome. Since, he’s published Head Games: Football’s Concussion Crisis in 2006 and co-founded the Concussion Legacy Foundation (formerly the Sports Legacy Institute) in 2007. CLF is now celebrating it’s 10th anniversary and I was fortunate enough to speak with Samantha Bureau, Director of Public Relations – Concussion Legacy Foundation Canada who was able to elaborate more on what CLF is and what is next for an organization that provides so much for so many. The GM’s Perspective: Can you explain the role the Concussion Legacy Foundation plays in Canada and athletics? Samantha Bureau: The Concussion Legacy Foundation Canada aims to educate communities across Canada through a variety of programming and initiatives. We pay particular emphasis on youth athletes because we believe that in educating today’s youth we can change concussion culture. By educating youth athletes that head injuries are something to be aware of and deserve proper medical care we can create a culture that this invisible injury is just as serious as a broken leg or arm. We love sports and want to see youth athletes benefit from sports the way many of us at the organization did growing up. We just want them to do so in a safe manner. GMs: You have a very extensive background. What exactly is your role in the organization? SB: My main role in the organization is to coordinate all of the programming and outreach initiatives in the Ottawa area. I recently took on the role of Directing Public Relations, but my day-to-day role within the organization is focusing on the Ottawa area and how we can educate the public. As a former research assistant at Boston University School of Medicine under Dr. Robert Stern in the CTE Center, I have seen first hand how repetitive head impacts can impact individuals, families, and communities. As I continue my own educational journey, I am very fortunate to be able to give back to the community and organizations that I played sports through growing up. GMs: Team Speak Up Day is coming up. What is the purpose of the day and who are you trying to reach? SB: Team Up Speak Up Day is scheduled for September 12th, 2017, but in actuality, the themes from this day can be carried forward all year round. The purpose of the event is to reiterate to our youth that head injuries are serious and that we can keep our teams safe by delivering a simple speech to athletes at the beginning of their season. This speech has three main points: 1) we’re a team, 2) because we’re a team we look out for one another, 3) as a good teammate, we expect you to speak up to a coach or a trainer if you suspect your teammate has suffered a concussion. Our goal is to reach as many of Canada’s youth athletes as possible with this message. 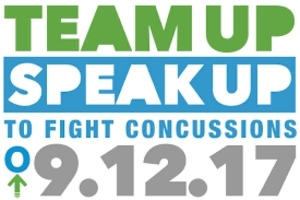 GMs: The Concussion Legacy Foundation has been in existence for 10 years now, what does that me to you and what do you think it means to all the families and athletes who have dealt with brain injuries one way or another? SB: 10 years is most definitely a great milestone for the Concussion Legacy Foundation. Here on the Canada side, we are very proud of our US counterparts on this accomplishment. While we are still in our infancy on the Canadian side, we see promising growth each year. For all those who have donated, suffered, or supported, this milestone is a great marker for the good that has been done and what has yet to come. GMs: With football still America’s game, and injuries common place, do you think the NFL is doing enough to protect its players. SB: Although I spent the majority of the past 5 years in the US for my undergrad and research years, I will admit that football has never been my main sport of interest. Growing up in your typical Canadian family, hockey was the sport I lived and breathed. With my basic knowledge of the sport I’m not the best person to comment on what the NFL has or has not done to protect its players. At the end of the day there have been important changes over the years and there will continue to be changes made in all sports of this nature. GMs: What is next for CLF? SB: We have a lot in the works for the foundation. While I cannot speak for the US side, the Canadian side has some great events and initiatives planned in the coming months and year. Our ultimate goal is to take the foundation nation wide. This year we expanded into Ottawa, Ontario and we’ve had nothing but support in our short time here. It is our hope that this momentum continues and carries us forward into new cities across Canada. GMs: If an athlete or others wanted to get in touch with the organization or learn more about it, what’s the best way? SB: We have multiple ways for people to get in touch with us about the foundation. First and foremost, our website concussionfoundation.ca, which is linked closely with the US site, concussionfoundation.org, has plenty of resources and information about who we are, what we do, and how to get in contact with us. We are also very active on social media and can be found on Twitter (@concussionCAN) and Facebook (Concussion Legacy Foundation Canada).